Other than operations requiring elevated privileges, all those reasons only exist in a production environment. During development we want the convenience of launching/debugging from Visual Studio and easy viewing of stdout/stderr, so we also want it to function as a console application. In our codebase and documentation this program is referred to as “layer0”. This and other Windows programming makes heavy use of PInvoke. http://pinvoke.net/ is indispensible. The key to creating a Windows service in C# is inheriting from System.ServiceProcess.ServiceBase. StartLayer0() and StopLayer0() are routines that take care of startup and shutdown and are shared by the service and console application. We first get the path and name of the current executable (layer0.exe). CreateService() is the main call to create a service. 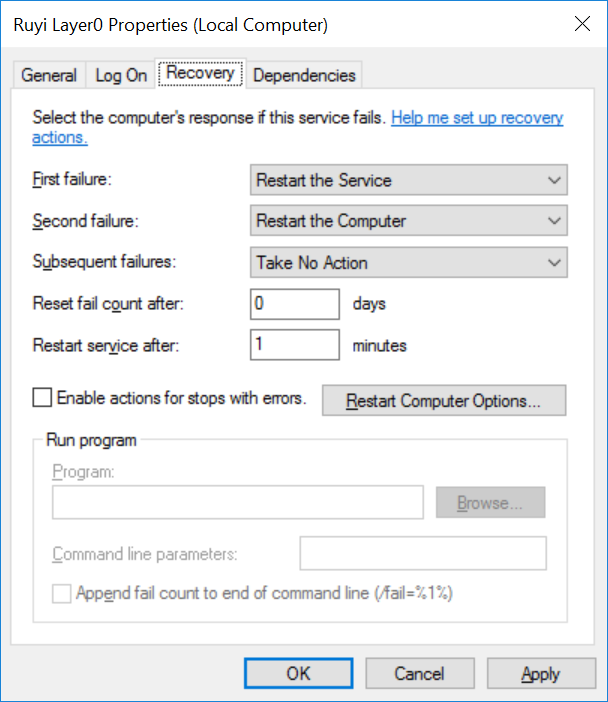 SERVICE_AUTO_START means the service will start automatically. The application specifies itself along with the --service command line argument. Our platform being non-critical to the system, ordinary users should be able to start/stop it. This is a particularly nasty bit of pinvoke. Blame falls squarely on the function to change service configuration parameters, ChangeServiceConfig2(), because its second parameter specifies what type the third parameter is a pointer to an array of. The majority of this is setting up a SERVICE_FAILURE_ACTIONS for the call to ChangeServiceConfig2(). As mentioned in its documentation, if the service controller handles SC_ACTION_TYPE.RebootComputer the caller must have SE_SHUTDOWN_NAME privilege. This is fulfilled by GrantShutdownPrivilege(). // Open the access token associated with the current process. // Retrieve the locally unique identifier (LUID) for the specified privilege. // Enable privilege in specified access token. We’ve got our Windows service running. Now we need to have it do something useful.